After infecting locales all over the world, the Resident Evil franchise is setting its sights on the sleepy town of Toronto, Ontario. This time, it is promising to be more of a blast than Resident Evil: Extinction. 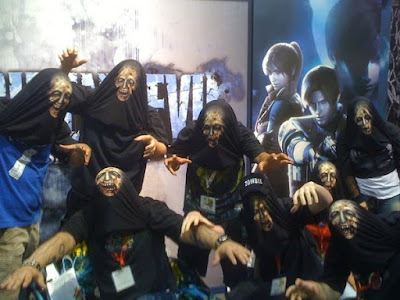 Capcom is setting up a booth for the 7th annual Toronto Zombie Walk that will help aspiring undead be even deader. They will be promoting Resident Evil: The Darkside Chronicles which is slated to come out the chilly morn of November 17th. And just because they're skipping the trend of releasing horror themed games before or on Halloween (I'm looking at you Saw and Dreamkiller) doesn't mean that it won't scare the Wii Remote out your Wii Zapper. For those unfamiliar, the Zombie Walk is a chance for zombifiles to get their shamble on in a parade like structure where everyone participating are dressed up like infected carriers. The cosplaying for this event is top notch with groups of friends setting up elaborate battles and take downs ala Left 4 Dead or tongue-in-cheek cameos (last year there was the late Ronald McDonald snacking on some McBrain sandwiches). Not everyone is the best with white foundation and fake blood and that's where Capcom graciously comes in; their booth will feature professional make-up artists who will make you a deadite free of charge. According to the Zombie Walk website, there has been over a hundred people who are dead serious about getting assistance to become a Thriller extra. If you live in Toronto and want to get in on the action, Capcom's booth will be in Trinity Bellwoods Park and they will exercising their mortician talents as of 12:30pm. The organizers have warned that anyone coming by the tent to get there early and bring a small make up bag just in case supplies run out. The Walk itself will be leaving at 3:30pm after opening ceremonies at 3pm where all zombies will eventually end up overrunning Bloor Street. If this doesn't get you out than you do not have the heart of a true Zombie.